Cooking spare ribs slowly on a barbecue keeps the meat moist and infuses the ribs with flavors. 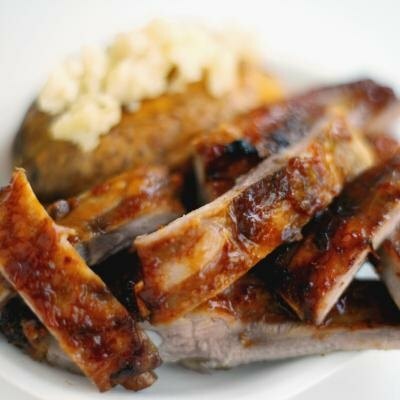 The ribs can be coated with either a dry rub or barbecue sauce. The ribs should be prepared properly before you can cook them on the grill. Taking the time to prepare the ribs protects the flavor and also ensures that they cook properly. After you grill the spare ribs, serve them with grilled corn for a simple meal. Rinse the spare ribs under cool running water. Pat the spare ribs dry with paper towels. Remove the skirt from the spare ribs with a sharp knife. The skirt appears as a thin strip that runs along the membrane on the back of the ribs. Insert a knife under the skirt and slice it off from the ribs to make the section even. Remove the membrane from the back of the spare ribs. The membrane appears as a dull film. Lift a corner of the membrane with a knife and grab onto it with a paper towel. Pull the membrane up and away from the ribs carefully. Trim excess fat and connective tissue from the ribs with a sharp knife. The excess fat burns easily on the grill and can cause flare-ups. Trim the ribs to fit your grill. Cut off ribs from the thinner end with a sharp knife between two rib bones. Marinate the ribs with your preferred rub or liquid sauce for at least 4 hours in the refrigerator. This allows the seasonings to soak into the ribs. Brush the ribs with barbecue sauce during the last 30 minutes of grilling time. This prevents flare-ups and burns. Lifting the grill to marinate the ribs with the sauce too often also allows the heat to escape, which prolongs the cooking time. Grill the ribs over indirect heat on the grill. Maintain a temperature of 250 degrees F. Cook the ribs for 3 hours or until the bones protrude from the ribs slightly. Always wash your hands and utensils before and after handling the raw spare ribs to prevent a food-borne illness.